Hex Mountains is a black mass, that rends the veil of consensual reality, plunging the listener into a twilight afterlife of elder gods and ancient wisdom. It’s good to have post-rock back. For years, it seemed that all the genre could produce was ham-fisted Mogwai knock-offs that lost the emotional subtlety and expansive listening habits of the original movement. Imitators with long names sucked the marrow right out of post-rock’s bones until it was an embarrassment, a shell of its former self. People forgot how thrilling it could be to combine the crushing weight of metal with the sonic possibilities of electronic music, and the weird eeriness of drone. The Denovali Records release of two albums from Montreal drone alchemist Eric Quach, who has released over 50 albums under the name thisquietarmy, suggest that this is about to change, and that it is again okay to appreciate epic instrumental rock ‘n roll; people are finding new and interesting things to do with the format. Hex Mountains suggests a new phase in Thisquietarmy’s extensive catalog. After touring with heavyweights like Year Of No Light and Deafheaven, Eric Quach wanted to turn up the intensity. He shattered the traditional isolation of TQA’s somnolent soundscapes, to enlist members of Alashan, Northumbria and Monarch. It’s some of his most pummeling work to date. “From Darkness” starts things off like the opening of a ritual: a synthesizer fills the role of tambura, whose insectile drone creates space in Indian classical music, until leaden heavy metal drums split the air like thunder and electric guitar outlines the raga. There is a shamanistic feeling to the proceeding, thanks to a synthesized pan flute. It’s like the Andes meeting the Himalayas — and then, all of a sudden, you are nowhere, as the ritual climaxes and the portal opens. You are thrust into infinity with an army of crashing, burning guitars. “Wraithslayers” and “Digital Witchcraft”, which make up the bulk of the record, break up the bombast with inky seas of dark ambient electronics, ghostly siren-calls off in the distance (courtesy of Emilie Bresson and Jeanne Peluard of Monarch), while spirit orbs and will o’ the wisps dance around the peripheries. This is the Land Of The Dead, the source of all power. It’s pretty dark, but witchcraft often is. It’s some of thisquietarmy’s finest work, and an example of the possibilities of combining post-rock with outside influences. Hex Mountains could be a way to acclimate yourself to black metal and noise, if you have not yet explored those pitch black seas. “Spirits In Oblivion” completes the circle with an explosion of tribal percussion, worthy of doom metal masters Neurosis, and a return to the “From Darkness” theme. It’s cohesive, and conceptually sound, making for a powerful headphone journey that will leave you mightier in its wake. It’s funny that Eric Quach doesn’t consider himself a musician, considering that he’s put out over 50 albums. A lack of formal training means that he approaches music from a painterly point of view, and he creates eerie, epic, beautiful, surreal visions, indeed. In the past, he’s expressed insecurity working with other musicians, as he doesn’t speak the lingo fluently, so it’s encouraging to see him branching out and collaborating with others. 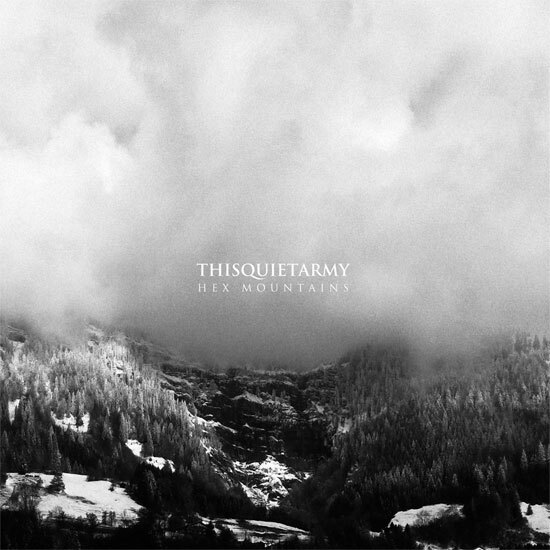 It must be working, as Hex Mountains is one of thisquietarmy’s most powerful and effective releases to date. In honor of Hex Mountain‘s release, Denovali Records is also reissuing Blackhaunter, thisquietarmy’s second album, on CD and Vinyl for the first time. Hex Mountains and Blackhaunter are out now, digitally, and will be released in physical formats in November.